From the original movie created in 1972 by Federico Fellini, Fellini's Roma, I created new images by filming into the television screen, playing the film. By reframing the images, by moving the dv camera like an eye of a possible spectator, in this case myself, I create a subjective selective focus on attributes of the images shown. At the same time I enter a dialogue with the original camera guidance, original framing and movements. 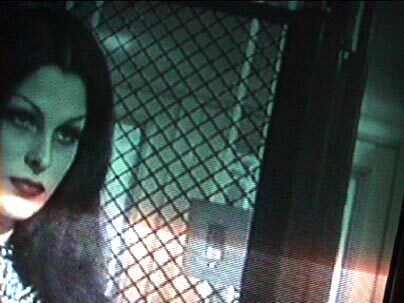 While filming I concentrated sometimes on the spaces in between the "wanted main figures or actions" in the image (like in the Pope scene), or I focused on important details like the look of the prostitute to the young client in the lift taking them up to her room (in the bordello scene). Sometimes I move the camera so much, that the frame is bigger than the actual image so that it shows the room behind the television, the room in which the work has been created. By the flickering of the television and the automatic brightness adjustments of the amateur camera, the light in the background starts changing all the time, creating a spooky atmosphere. When there are scenes, like in the theatre scene of the film, where there is the performer performing for the public, which again is performing for the original movie, then for the new video, to the public in the installation, which again is performer in the installation, the intention of the work to create a space of authority for the visitor/user is most evident and the intention of Fellini is transported to the here and now. In a similar way, the content of the film, the portrait of the City of Rome, its cultural history, the history of art as such from Roman times up to now, is being brought until the actual artistic creation in the here and now, means the absolute contemporaneity of art. More contemporary as in the now is impossible. Thus the involvement of the visitor/user into the creation of an art work, especially by painting, a media being used also at Roman times, the reality of this art history in the physical body of the visitor is being invoked and brought to manifestation into an art work, which again might travel a while along art historical evolution. As the principle of my work is synthetic, also my nonfigurative painting is synthetic (the contrary of abstract). By my intuition I relate to the person present, to aspects of the person or the choice of the body part, he or she chooses to be painted. I do not judge any attributes or manifest a personal emotion in my work. It is about the energy of the color in relation to the energy of the presence of the person. The visitors choice - The visitors free choice to take action in and for the installation to change its attributes has to stay totally volunteer. It has to be sure that he or she takes full responsibility for the action, thus has full authority on the choice of participation, choice of the body part. But not the choice of the colors I use or the way the painting is being created by myself. The focus is to have the visitors authority meet with mine, so my authority as a painter has to stay intact, unsplit. It is not a participation in the sense that my authority I share. I do not share it, otherwise I would split, thus destroy, my artistic authority on my work. That would mean that the project is degrading to a kind of workshop. At the same time I do not take authority of the visitor/performer/user concerning his choice of performance quality: how she is installing herself, the chosen body part, the action or non action she is choosing for. It is a question of existential presence of the person and myself at that particular moment of art and cultural history, at that particular place, at that particular moment of personal history of the two persons involved. It is a spiritual and physical meeting and involves a spiritual and physical touch. The quality of the content does not depend on the quantity of persons participating or the choice of participation, The manifestation of a non participation is as important for the installation as the manifestation of participation by the visitor/user. 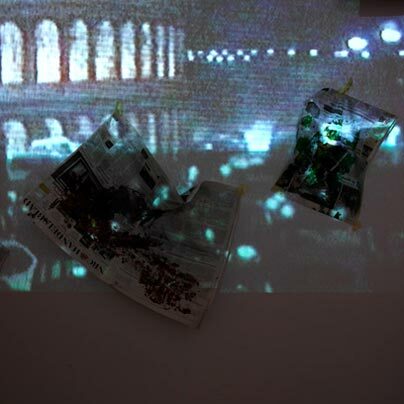 The image from the camera fixed above the "performance table" projected to the right side of the installation shows the presence of a person taking action or shows the absence of presence. The absence of presence is also a manifestation and choice by the visitor/user/performer present. Both aspects are of equal value. Because it is a matter of presence, the social, political, religious, racial appartenances of the persons are of no importance. As at the moment of birth and death we are all existentially equal, at the place of the installation, and as performers in the installation everyone is equal. It is not changing the quality of content and intent, how many visitors/ performers really take action and permanently or for a certain time influence the form of the work. Each participation is extremely important to the art work and its manifestation, for it changes totally its formal appearance. But the quality does not depend on the fact, if there are 10, 100 or 1000 persons participating. This is totally unimportant. Each meeting is unique, most valuable, exceptional and important to the work and the work is each time fully accomplished. Nikunja, after the exhibition in TENT of Rotterdam, based on the experiences of the first presentation of Fellini Now! 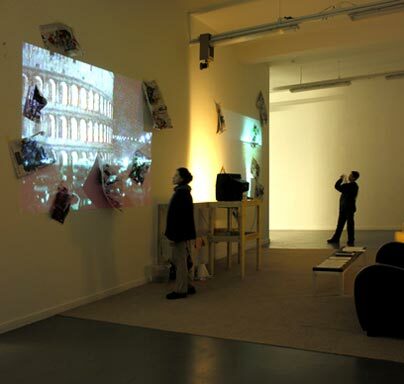 in October 2005 and the action and reaction of the visitors/users/performers. Fellini Now ! is an interactive interdisciplinary art installation which relates the world of infinite representation by all sort of media, to the here and now of being human in bone and flesh. It interrogates the creation of image as such and its history (the film ROMA) and merges the authority of its creator and its viewer. The installation relates the perfection of the digital virtual limited, flawless, predetermined reality of the calculating machine to the mistake, failure, imperfection, uncalculatable, unpredetermined reality of the human being and of being human. The limit of the predetermined, finite one, opposing the limitless, infinte absolute. Dark Room : A Television-Video screen installed on a wooden bench (120cm x 60cm x 80cm ) at 120cm over the floor, at least 80cm diameter, 60cm from the white wall, facing the wall. The wall is covered with a mirror or a painting. A second wooden bench (h 120cm/w : 60cm / l : 190cm) installed between wall and screen. The video is playing the original images of the film «Fellini's Roma» in loops with the real, original soundtrack (Italian) on in loud volume. A digital video camera is installed in the middle above and over the installation, focusing on the space between tv screen and wall. The image shows (frame) on one side the wall , the other the upper board of the screen and in-between the surface of the bench from above. The digital camera 's images are being shown in real time projected by a beamer on the the wall to the right side of the bench in a format of about 2,5 m by 3,5 m.
On the left side of the bench is a video beamer projection of the same size as on the right side. 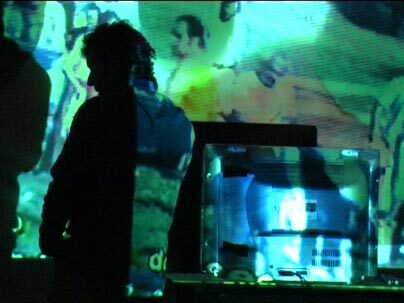 This video consists of images I created filming the tv screen playing Fellini's movie. I reframed the image by filming into the tv screen, concentrating on parts in the image, re-evaluating the subjective look of any possible viewer. Sometimes the apartment in which the television has been standing is becoming visible. As in Fellini's movie the filmpeople who create the film become visible, in the reproduced movie the viewer becomes visible by the movements and selection of the camera and the environment in which the film is being seen. The installation is part of a lounge setting with carpet (6 by 8 meters or according to the space available), low tables and two couches and a living room lamp. A small movable lamp by the bench can help the performer there to highlight certain parts of him and gives the necessary light to the painter. The moment the visitor enters the installation he/she becomes the performer, as the spectator in Fellini's movie. sitting as spectators in the filmed theatre, are actors for they are in the fiction film. They may sit on the couches, watch the movie or observe the visitors who choose to accept the invitation to climbon the little stage of the wooden bench and perform there. There they may watch the original movie or act in any way they would like. I would invite them to think of a part of their body which they feel relevant to the movie or to them. I would paint that part of the body with a unfigurative totally subjective painting, relating to what I would recent from the person. Then I would imprint this painting on a newspaper of that day and of that place and stick into the flickering video projection. Sometimes I would invite professional models/performers/actors to involve themselves in the installaion/performance. The light of the film being reflected from the skin and the body, spreading into the space, onto the visitor face, creates an atmosphere of a fireplace, intimate, homey around the body and the movements of the body exposed and the visitors in the space. The imprints, the paint, is creating a material and colour contrast to the filmlight, communicates to it, spreads out into the space on this little papers, shrinkled a bit and very simply stuck to the wall at different heights and without a specific order. They , too , will create shadows to the wall, are difficult to really see in clear and stimulate the imagination of the visitor in the space. During exhibition, people might just lay down on the bench for a while in this atmosphere and there thoughts and feelings spread in the space, an interaction happens with other visitors. It is an intimate private atmosphere in a public space, feeling lively and being related to our being human. The vital and vibrant film of Fellini is inspiring this general feeling of livelihood. Still there is painting, but I am fascinated by the disappearance of colour and the disappea-rance of image as such, as a beautiful unknown woman in the crowd, who looks at you with an eternal look, turns around and disappears in the crowd for ever. Then the woman becomes an angel and the look becomes light, light in your mind and heart. But she has disappeared for ever. It is not about the nostalgic of the ever lost, it is about the space which is created inside of you by the absence. The colour which is changing in the flickering coloured light, the blind painter who chooses the colour not with his physical eye but with his existential eye, the viewer with the sharpened will to see, to recognise, seeing in one colour all inner colours of his existence, changing forms and frames, coming close. The disappearance of image in the overflow of images, the contrast of material of image, the immediateness and the infinity of image. Image is before thought ; if image is dead, reason is dead. That's what we live today. Images will give birth to new reason. The flawless predetermined calculated image of the digital age, faultless, in contrast to the image of the human touch, the undetermined uncalculated appearance. This space emptied of the calculated illusion of our bodiless time. Fellini creates in this film the total destruction of the illusion of cinema, and at the same creates the most fabulous experience of cinema. At the same time he constructs and deconstructs the image of the City of Rome, ancient capital of «European culture», covered by Mussolini, the Pope, the traffic, the noise and the pollution, the prostitutes and the corruption with mud and the layers of ignorance over 2000 years of culture. And this is culture again : the amor of roma, are the prostitutes, the extravaganza, the cry and will to live, to excite, to be real. Being real is being the good and the bad, being beyond the two. This content perfectly fits to the intention of my installation. 2 couches, living room carpet of a size according to the space of the installation, a weak standing living room lamp, low table, digital camera of good quality to film in dim light, tv screen at least 70cm diagonal, two beamers and their replacement lamps, 1 dvd player, 2 wooden benches in the defined formats Acrylic artist paint, towels, water, newspapers of the day and that place.